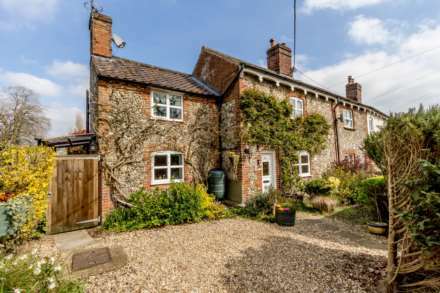 Charming detached brick and flint character cottage dating back to approximately 18th century. Situated in the popular village of Stoke Ferry, this delightful well presented property offers a kitchen/diner, lounge with open fireplace, low maintenance garden, garage, parking and double glazing. The property offers: lounge, kitchen/diner, two bedrooms, bathroom, garage, low maintenance front garden, double glazing and oil central heating. The Norfolk village of Stoke Ferry has a good range of amenities including - Village Shop, takeaways, post office, primary school, hardware store and community centre. Downham Market with its supermarkets, restaurants and all the usual town facilities lies approximately 6 miles away with a train station on the main line to London Kings Cross. Double glazed entrance door to front, fitted kitchen units to wall and floor, work surface over, integral electric oven with ceramic hob and extractor hood over, space and plumbing for washing machine, space and plumbing for dish washer, sink unit with mixer tap and drainer, wall mounted central heating boiler, wall lights, exposed ceiling beam, pamment tiles to kitchen floor area, wood effect laminate to dining area, two double glazed windows to front. Feature cast iron open fireplace with wooden surround and tile hearth, exposed ceiling beams, stairs to first floor, understairs storage cupboard, three double glazed windows to front, television and telephone point, radiators. Built in storage cupboards/wardrobes, access to loft. Built in wardrobe, wall lights, radiator, double glazed window to rear. Fitted with a side panel bath with mixer tap shower over, WC, wash hand basin, towel radiator, fully tiled walls and flooring, double glazed window to front and side. Single garage with up and over door to front, electric power and lighting. 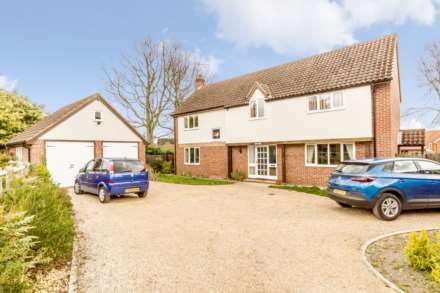 The property is approached via a shared drive leading to the garage and parking area.